partial load. During no-dredge environmental time windows, shoaling may become so bad that ships need to anchor off site and lighter their cargo to and from your dock. 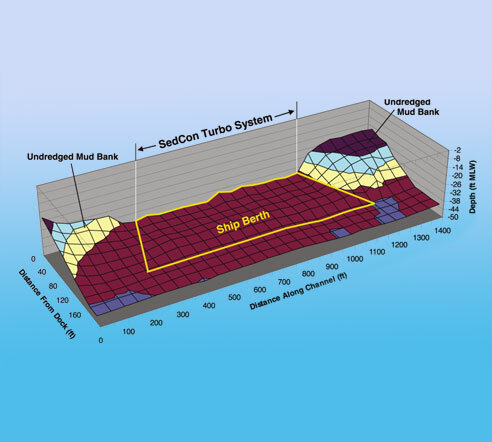 With a SedCon® Turbo System, your berth stays at full depth allowing higher thru-put for your dock and greater profits for your company. The image at right shows how one of our systems has eliminated dredging for more than 10 years at a site that used to shoal more than 12 ft/yr.